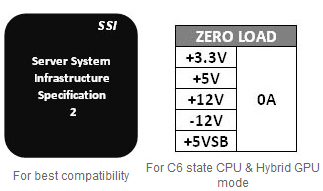 Compliance with Intel ATX 12V 2.3 & SSI EPS 12V 2.92 standards. 80 PLUS Platinum certified – Extreme efficiency PSU series with 89-94% efficiency @ 20-100% load to cut down electric cost. 24/7 @ 122°F (50°C): Guaranteed to deliver 1275W continuous power even in the worst chassis conditions; up to 122°F (50°C) internal chassis temperature. S.P.T. 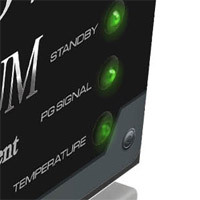 Indicator: PSU status monitor with 3-mode LED (standby / PG signal / temperature) will let you know if there's a problem before it becomes a bigger problem or even ceases function. 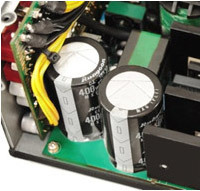 High quality 221°F (105°C) Japanese capacitors ensure superb performance and reliability. 221°F (105°C) Solid state capacitors: Great stability at higher operating temperatures, frequencies and currents. Interleaved PFC circuit provides extremely high PF value and high PSU efficiency. Smart Fan Control system optimize the thermal performance and minimize audible noise. High current massive +12V rails: robust dual +12V rails design providing up to 45A for 12V1 & 65A for 12V2. This ensures there is plenty of power on demand and ready for any need. Heavy-gauge 16 AWG High Current cable at PCI-Express connectors reduce conducted resistance, increasing efficiency and improving power delivery ensuring your high performance graphics cards get the power they need when they need it! Multi-GPU ready: 8 x PCI-E connectors support up to 4-way ATI CrossFireX™ & Nvidia SLI™. Auto switching circuitry for universal AC input from 90 ~ 264V. Heavy-duty protection circuitry of Over Current, Over Power, Over Voltage, Under Voltage, and Short-Circuit protection. Helps protect your components should a problem arise. Safety / EMI Approvals: CE, TUV, FCC, UL, CUL, GOST and BSMI certified. Toughpower XT PLATINUM features 221°F (105°C) Japanese made electrolytic capacitors & solid state capacitors with low ESR, which greatly improves the durability and offers the highest stability and reliability. Toughpower XT Platinum adopts full bridge & LLC resonance circuit for extremely stable performance & reliability. Besides, built in the interleaved PFC circuit, Toughpower XT Platinum also provides extremely high PF value and high PSU efficiency. When you open the side panel of your chassis or look through the side window, you can see the PSU status quickly and easily. S.P.T. indicator with three-mode LED (standby / power good signal / temperature) for real-time monitoring over the power supply. 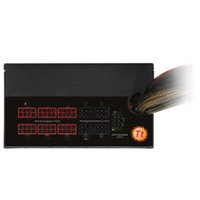 It helps the user to know the PSU working status, detect abnormal situations and protect your system. Cable management design improves internal airflow and reduce clutter by allowing removal of unneeded cable sets instead of hiding them. CPU load range from Max. to only 1W. Hybrid mode will cause graphics cards load range from Max. to only 1W. Toughpower XT GOLD & PLATINUM series are able to maintain an ultra tight DC regulation to support the C6 state CPU mode and the hybrid graphic card power saving mode by its Zero Load (0W) Design. Smart Fan control circuitry design, which offers three distinct operation modes, fanless mode, silent mode, and cooling mode. 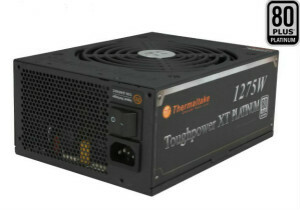 The Toughpower XT 1275W automatically adjusts fan mode and speed according to the ambient temperature level. This new design not only optimizes heat dissipation, but also keeps the most silent operation for your system by reducing unnecessary fan rotation. 4 x Peripheral connectors - 21.6 + 5.9 + 5.9 + 5.9"
4 x S-ATA & 1 x Peripheral connectors - 21.6 + 5.9 + 5.9 + 5.9 + 5.9"
4 x S-ATA connectors - 21.6 + 5.9 + 5.9 + 5.9"
Japanese Made Electrolytic & Solid Capacitors and superior circuit design Toughpower XT 1275W features 105°C / 221°F Japanese made electrolytic capacitors & solid State capacitors with low ESR, which greatly improves the durability and offers the highest stability and reliability. Moreover, Toughpower XT 1275W adopts full bridge & LLC resonance circuit for extremely stable performance & reliability. 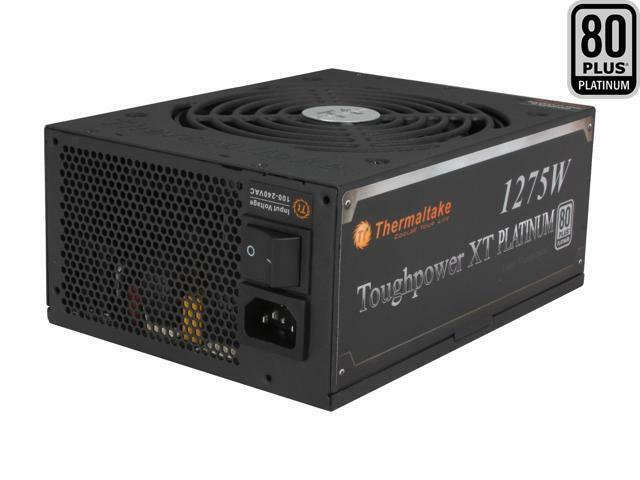 Besides, built in the interleaved PFC circuit, Toughpower XT 1275W also provides extremely high PF value and high PSU efficiency. S.P.T indicator: Quick Status Monitor The S.P.T indicator, with 3-mode LED (standby/power good signal/temperature) for real-time monitoring over the power supply, helps the user to know the PSU working status, detect abnormal situations and protect your system. When you open the side panel of your chassis or look through the side window, you can see the PSU status quickly and easily. Modular Cable Management Cable management design improves internal airflow and reduces clutter by allowing removal of unneeded cable sets instead of hiding them. Hybrid SLI/ CrossfireX and Intel C6 state mode support Toughpower XT 1275W is able to maintain an ultra tight DC regulation to support the C6 state CPU mode and the hybrid graphic card power saving mode by its ZERO LOAD (0W) Design. Featuring 8 x PCI-E connectors, Toughpower XT 1275W supports up to 4-way ATI/AMD CrossFireX & NVIDIA SLI to scale graphics performance. Eco design Toughpower XT 1275W saves energy through its high energy efficiency of up to 94% and is 80 PLUS PLATINUM certified. Supporting Energy Star 5.0 and Intel Deep Power Down C6 Status, Toughpower XT 1275W is suitable for use in Energy Star-compatible computers and helps your PC system operate more efficiently by supporting the newest low power states introduced by Intel. In addition, it also fulfils the EU guideline for ErP (Energy-Related Products) that are scheduled to apply starting in 2010. Fan speed & noise level The smart Fan control circuitry design offers three distinct operation modes, fanless mode, silent mode, and cooling mode. The Toughpower XT 1275W automatically adjusts fan mode and speed according to the ambient temperature level. This new design not only optimizes heat dissipation, but also keeps the most silent operation for your system by reducing unnecessary fan rotation. 24/7 @ 50°C: Guaranteed to deliver 1275W continuous power even in the worst chassis conditions up to 50? internal chassis temperature. Multi-GPU ready: 8 x PCI-E connectors support up to 4-way ATI CrossFireX & Nvidia SLI. Auto switching circuitry for universal AC input from 90-264V. We at Thermaltake apologize for the inconvenience this has caused. Please contact Customer Support to obtain RMA instructions and have your unit replaced through our warranty service. Pros: I've had it awhile without any issues. Other Thoughts: Replaced a 1000w 80 Plus Gold power supply that had issues running two 7970s in Crossfire. The Thermaltake XT TPX-1275M 80 Plus Platinum has no issues running two 7970s in Crossfire, 360 water loop CPU cooler w/three fans, four case fans, SSD, and HD. Stable 4.7GHz with an i7 6700K. Other Thoughts: I did not realize the problems i was having were in my PSU until it became increasinly more frequent. We at Thermaltake apologize for any inconvenience this may have caused. 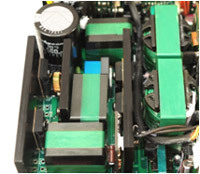 We can replace your power supply through our warranty service. Please contact Customer Service to obtain RMA instructions. We at Thermaltake apologize for the inconvenience this may have caused you. Please contact our customer service team about this issue. Pros: Good and lots of power, with the 24 pin and a pair of 8 pin connecters you are all set for a Xeon dual CPU system, plenty of connecters for hard drives and video cards. Other Thoughts: Make sure your case can handle it. I had to adjust my Thermaltake Armor 8000 case to get it in. It Is BIG, but if you can get it in your case than its not too big. Cons: Received unit that was defective (spontaneously power cycling in two different computers) and replacement unit had same issue. My old PSU works fine in both systems so I don't think I had a MOBO or some other issue. We at Thermaltake apologize for any inconvenience this may have caused. We can replace it through warranty service. Please contact Customer Service for RMA instructions. Cons: Like so many others, failed at 6 weeks, almost on the dot. Other Thoughts: Would not recommend using, ever, for any reason. We at Thermaltake apologize for the inconvenience this may have caused you. We can replace it through warranty service. Please contact our customer service team for RMA instructions. Pros: Has the appearance of quality build. Nice modular power cable design and includes cable management extras. Worked out of the box. Cons: Failed after 6 months of use. 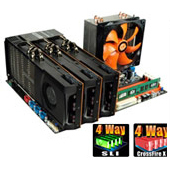 Other Thoughts: I purchased 2 of these power supplies to run a pair of KnCMiner Jupiter bitcoin mining machines running at approx. 650 watts each. One power supply has failed completely, and the second is unable to operate the slightly more powerful Nov miner.